The Tennessee thirty (30) day termination letter may be used by a landlord to notify a tenant that their month-to-month lease is being terminated. The landlord does not need a specific reason to terminate the lease agreement as long as the reason is not in discrimination/retaliation of the tenant. 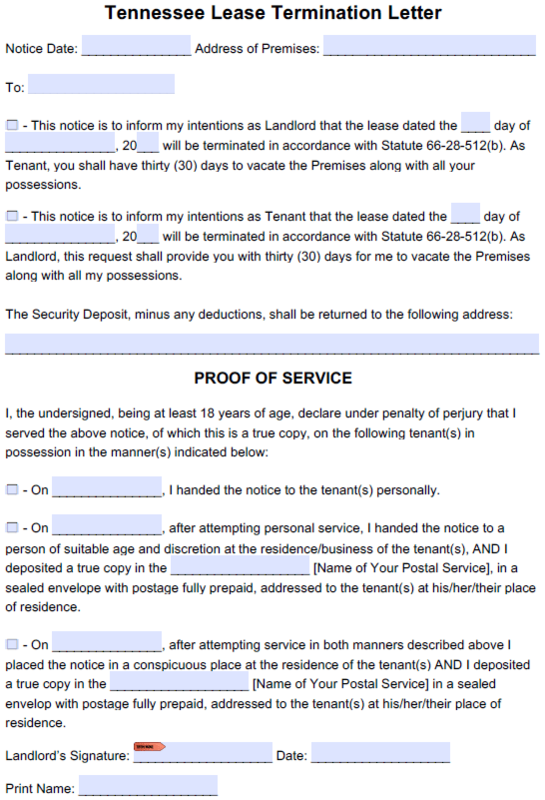 The termination letter provides the tenant with thirty (30) days to vacate the rental unit. After the thirty-day (30) window has passed (and the tenant has failed to move out), the landlord can file an eviction lawsuit in the Circuit/General Sessions Court in the county of the rental property. Note: The thirty-day (30) notice period begins on the date that the next rent payment is due.